Are you in the market for new furnishings for your home? Do you want to make sure that you not only get the best prices on your furniture, but that you also get items that are highly durable and made from some of the finest woods in the US? If so, look no further than the beautiful and durable furniture items that are lovingly crafted by the Amish. If you are looking for Amish furniture in Ohio, you need look no further than the Amish Originals Furniture Co. Here you will find unique and beautiful handcrafted furniture and home décor items that will help you decorate every room in your home. The Amish in the United States have a long and rich heritage. They came to the US from Switzerland in the 18th century after Jakob Amman, a Christian who did not agree with many of the Mennonite church’s disciplinary measures, created his own faction of the church. Followers would soon be known as Amish. Not long after forming his own church, Amish immigrants left Switzerland to seek new lives in the US, with most settling in Pennsylvania, Ohio, and in the Midwest. The Amish are known worldwide for their strong work ethic, and they quickly became known as some of the greatest furniture manufacturers in the world. The furniture created by the Amish is not only made from the highest quality materials, but it is also extremely well made and will hold up to any abuse a busy family can throw at it. One of the reasons why Amish furniture is so prized is the great attention that is paid by the craftspeople to every little detail. These people take great pride in their work, and use the best materials available to them. You know that when you purchase a piece of furniture that has been crafted by Amish hands, you are going to get a piece of furniture that is of the highest quality. For the best Amish furniture in Ohio, furniture that you will love for a lifetime, you don’t have to waste your time and money visiting discount furniture stores or department stores that have small selections of mediocre-quality furniture items. At Amish Originals Furniture Co. you will find a huge selection of furnishings for every room in your home, and there are sure to be many items that you are going to absolutely fall in love with. In fact, not only will you find beautiful and well-constructed furniture items, you will also see many home décor items, including unique, one-of-a-kind art pieces that will finish off your home decorating beautifully. 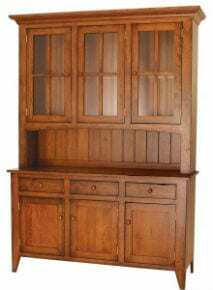 If want to find amazing Amish furniture in Ohio and you are thinking about redecorating your home with new furniture and other items, don’t waste your money on items that may look good now, but will not stand the test of time. Instead, visit the Amish Originals Furniture Co. showroom in Westerville Ohio. Visit us online at amishoriginals.com to do some window shopping. While you’re there, sign up for our newsletter to receive special product updates and promotions.